On a laptop or notebook computer, when user closing the lib, the computer will turn off the LCD screen display and then put the computer into sleep (stand by in Windows XP) or hibernation mode. In Windows operating system, including Windows XP, Windows Vista, Windows 7, Windows 8, Windows 8.1, Windows 10 or later, the behavior when closing the lid on laptop or notebook PC can be changed and tweaked to user liking. Turn off or disable ability for laptop and notebook to sleep or hibernate itself is useful for users who want to leave the computer for a while, and want to be able to start work immediately upon opening the lid when returning to computer. 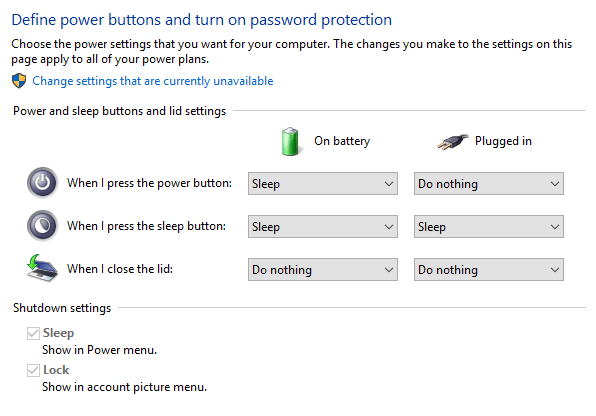 Do nothing while closing lid also prevent the system, from requesting the user’s password upon returning from sleep (see how to disable password requirement on wakeup), standby or hibernation after re-opening the lid. 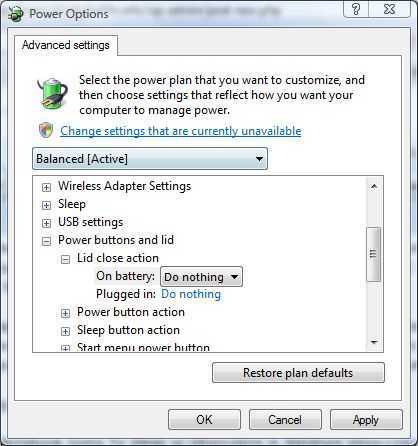 In the “Power Options” dialog box’s “Advanced Settings” tab for the active power plan, expand Power buttons and lid. Change the value to Do nothing for “Lid close action” by selecting a new option from drop down menu for both On battery and Plugged in. Based on own preference, it’s possible to set other action from the menu too. Available for selection is Do nothing, Sleep, Hibernate and Shutdown. 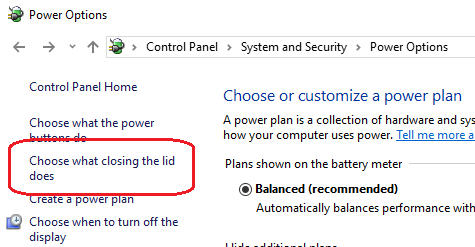 If available, it’s also possible to hit the Choose what closing the lid does in the left pane of Power Options. Then, select Do nothing in the drop down boxes for When I close the lid for On battery and Plugged in columns. Hit Save changes when done. Under “Power buttons” section, select Do nothing from drop down menu for When I close the lid on my portable computer option. Again, any other settings such as Stand by and Hibernate can be set based on own preference.